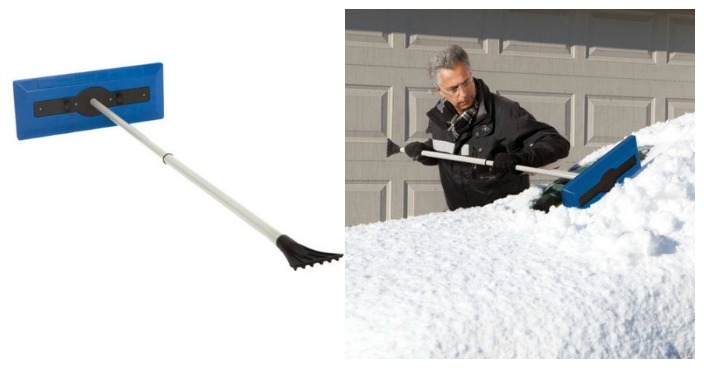 Telescoping Snow Broom With Ice Scraper Just $12.99! Down From $19! You are here: Home / Great Deals / Telescoping Snow Broom With Ice Scraper Just $12.99! Down From $19! Right now you can get this Telescoping Snow Broom With Ice Scraper for just $12.99 (Reg. $19) at Walmart! With the Snow Joe Snow Broom with Ice Scraper you can easily push heavy, wet snow off the roof, hood and trunk of your vehicle making cleaning easy work this winter. The durable, reinforced polyethylene foam head has been tested for non-abrasiveness, freeze resistance, center load stress and durability to achieve the highest ratings. The high-impact plastic faceplate is recessed into the foam to prevent contact with the vehicle preventing scratching. The telescoping handle extends up to 49-inches providing maximum reach with no strain on the operator. The broom also features an ice scraper as well to assist with ice buildup on your windshield.